(I've been writing this review for three nights and never quite getting it right, so I'm just going to go ahead with what I've written so far.) This year, I seem to have read a lot of books about characters (real or fictional) who try to get to know their roots better. 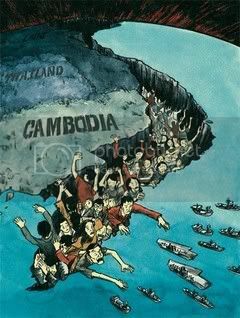 Some go to their native country or the country their ancestors are from. Others reconnect with their families. I don't know if I'm semi-consciously levitating towards such books or if it's all chance. This is the second time that I'm reading a book on such a theme via the graphic medium (the first was Maus). I was curious about how this would turn out. On one hand, this is a great medium for demonstrating the feelings and emotions of the characters. On the other hand, getting to know your roots mean a lot of introspection - not always well-displayed through pictures. Some amount of dialogue would be needed and the artist's talent determines how well he can convey that without getting too wordy. 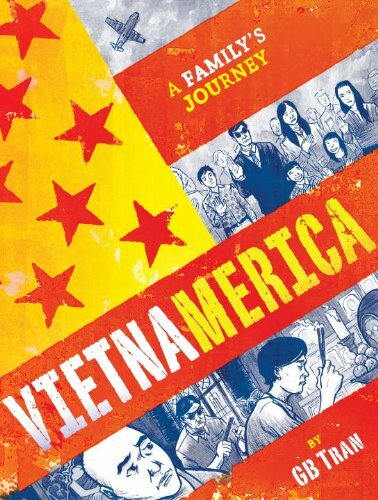 Vietnamerica by GB Tran is an account of the author's trip to Vietnam with his parents and his discovery of his family's rich ancestral history, of which he knew nothing about, nor professed any interest in earlier. He had a vague idea that his parents had fled Saigon in the 70s, but they never talked about it. It is years later, when the author's two living grandparents die within a few months of each other, that they make the trip to Vietnam - to pay respects and to connect with their history. There is a lot that goes on in this book. GB Tran paints a history that goes back to three generations in his family. His father's reticence and his mother's commitment to a fractious marriage are the main two issues resolved, but both are consequences of actions much older than them. We don't quite get there until the end, but the evidence is seen very early. Rather than provide a chronological approach, GB Tran links specific events or chapters by context, thereby letting the reader draw the connection between the characters. Occasionally he slips between the present and the past, thereby forging a connection between an antique object or a specific characteristic, to something in the past. I found this stress on context really worked well, because as readers, we may not remember pictures as easily as specific incidents described in words. The downside to this was that I had trouble keeping the timeline straight. Since events are linked by context more than time, the timeline wasn't always clear to me. And that's where the disjointed jumping around lost me. At 320+ large and very colorful pages, this book is huge! There are a lot of characters, and at times, I did get them mixed up - I didn't have trouble with names, but occasionally I forgot who a specific character was, or which set of grandparents the author was talking about. Still, after a while, I did get them all straight and adapted well to the flow of the book. It's especially painful thinking how much the effect of something that happened a generation or two ago can still be felt so acutely. There's the grandfather who was pretty much absent from his son's life, but then that son grows up to be a distant and taciturn father. Overall, I thought this was a pretty decent attempt at the exploration of one's past in graphic media. I don't think it worked as well as it could have. GB Tran's artwork is certainly very beautiful. There are vivid splashes of color across the pages. The author however doesn't appear to be actively interested in all the history - he seems to be a disinterested spectator at best. Eventually, when he does make the jump, I found it hard to believe. Still, the history of Vietnam made for rich reading. It's always nice to read about it from the local perspective. I borrowed this book from my library. The part about "getting to know your roots" instantly brought to mind one of my favorite books - Roots by Alex Haley. The premise for Vietnamerica does remind me a lot of Roots, though from your review, it seems that it has both good and bad points. The timeline thing can be a problem for me too. I usually really enjoy books in which the author is exploring his/he roots, but this one seems like it might be a bit too jumbled. Maybe a timeline in the front or back would have helped. I've been to Vietnam so that aspect of the book definitely appeals to me and we got a huge influx of Hmong in the 1970s in my town. I think I would have probably have had a hard time with this one as well. The thing is, it sounds like it would have been a great story had it been written in the traditional fashion instead of turned into a graphic novel that didn't really clearly express it's message and was a little lukewarm. I think I am probably going to be skipping this one, but I did enjoy your review very much! I was definitely very confused by the timeline in this book and often got confused between characters and who was narrating and all sorts of things. I read an ARC, though, without color, so I would hope it was a little easier to differentiate with the color added in! I have not read it, but it has a cool cover. I love when publishers put effort into the cover of a book. I've been dying to try another graphic novel since reading (and loving!) Maus and Craig Thompson's Blankets. This sounds like a story I would enjoy! Great reveiw, was this a memoir? Kind've reminded me of the Joy Luck Club, with the traveling back to explore his roots. I loved that book, but I don't know about this one. I like when the author sounds excited about the history of a new country, sounds like he missed the marked. I haven't read Roots, though I have heard quite a bit about it. I'm glad to hear that it's a favorite - I'm looking for it. I agree - some kind of a timeline would really have helped. Esp since we are following multiple characters, it wasn't easy keeping track of all. The art is certainly gorgeous, and I do think it is an important part of a graphic book. I hope you get to read this - perhaps you may enjoy it better? I agree - I think this would have worked better as a prose-memoir. The timeline was just a little to confusing. I did look at the color for inspiration, but there are really too many timelines running - it's not just a clear present vs past. Maybe then I would have "got" it better. I hope you will try this. I also loved Maus and Blankets! You should also try Stitches by David Small. Yea, this is a memoir. I haven't read Joy Luck Club, but I've heard it's amazing! I need to check it out. Yeah, the cover is just fabulous! The art inside is also pretty good.